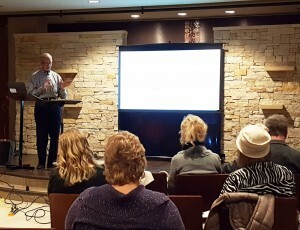 Dr. Charles R. Hamel, MD gave an overview of the therapy known as Low Dose Immunotherapy (LDI), Small intestinal bacterial overgrowth (SIBO), and connections to autoimmune disease. His talk was followed by a lively question and answer session. nt via Skype. LDA and LDI can be given simultaneously. An example protocol sheet was provided to the attendees. Symptomatic patients tend to have abnormal helper to suppressor cell ratios. One goal of treatment is to help the body produce the correct amount of suppressor cells which work to decrease inflammation. Full development of suppressor cells is expected in 21 days from the LDI dose with the subsequent dose following in 7-8 weeks. Cortisone can be used to ameliorate any distressing post-treatment symptoms. GI tract involvement significantly impacts the immune system. SIBO describes a condition in which gas abnormally builds up in the small intestine. Methane typically causes diarrhea, whereas hydrogen leads to constipation, bloating, and pain. Specific antibiotics have actions restricted to the small intestine. asts, and molds were noted as significant factors. Martha Boykin, the president and founder, announced that the group will be changing to every other month meetings. The next meeting will be in March. Online registration closes at noon on the Friday prior to the meeting. Martha also shared that she has prayerfully decided to step down as president, due to health concerns, and new leadership is being sought. She will remain on the board, continue to attend meetings and be involved with the group. North Texas Lyme Group hosts a monthly support group focused on sharing information and providing support to those affected by Lyme disease.